Change is inevitable, new technologies, new products and special content are constantly being introduced into a dynamic market place. When products change protective packaging solutions must change with them, quickly and without hesitation. The good news is Advanced Packaging, Inc. (API) has the ability to offer a wide variety of custom case solutions from the industries top manufacturers. Not just different sizes, but different styles as well as varying materials used in their manufacturer, such as roto-molded, injection molded, vacuum formed, blow molded, fabricated and welded aluminum. This is important; we do not operate in one-size fits all market. At API our experienced engineers will match your product or special content to the appropriate protective case solution based solely on its unique characteristics and requirements. Regardless of size, quantity or style API can provide the perfect custom single lid protective case solutions faster and more affordable than anyone else. API offers a variety of custom rotational molded, or in short roto-molded cases for the transport and storage of all types of equipment and goods. These heavy-duty cases are made from polyurethane plastic, are easily accessorized, provide excellent durability, shock resistance and water resistance. Roto-molded cases are ideal for both commercial and military applications. Roto-molded cases are designed and manufactured to safely hold goods from as small as a camera to as large as a jet engine. Roto-molded cases come in a variety of colors, are pad-lockable and feature corrosion resistant hardware. Heavy-duty, rugged and water-proof are terms synonymous with injection molded plastic cases. API ‘s Injection molded plastic cases offer a compact transportable environment for all your sensitive equipment. These cases provide tremendous impact resistance even in low temperatures. Staples of the U.S. military, injection molded cases are airtight, watertight, dent resistant, shatter resistant, lockable and will last a lifetime. Injection molded, single lid cases are sized to handle most transport or storage requirements and can be accessorized (depending on size) with extensions, handles, wheels, or even physically modified to meet your individual needs. Today’s advanced metal forming technology and processes allow ultra fast, affordable manufacturing of fully welded aluminum cases. From ultra high-end retail to critical military field applications, a fully-welded aluminum case is built to perform under extreme conditions. Not just once, but over and over. A fully-welded aluminum protective case from API is reusable, reparable, highly customizable and at the end of service completely recyclable. Welded aluminum protective cases are very lightweight and offer real advantages over traditional plastic cases. 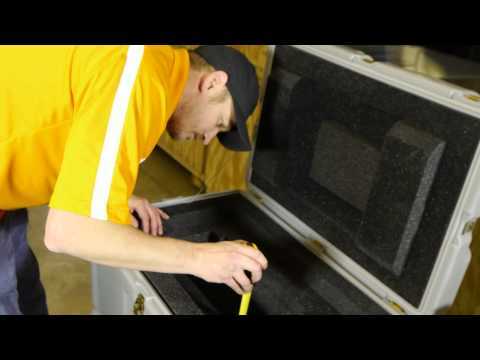 Welded aluminum protective cases can be manufactured to any size and/or weight carry capacity.